How much do Seahawks suites cost? Prices typically range from $18,000 -$30,000 for fully private Seattle Seahawks suites. Prices vary based on opponent, day of game and suite location. Luxury suite prices for concerts and other events at CenturyLink Field can vary widely based on the type of event. The luxury suite level is considered the second suite level. Seahawks suites feature premium in-suite catering options, VIP parking, HD-TVs, wet bars, upscale furnishing, and private restrooms. With a Seahawks suite you will receive exclusive access to VIP lounges and private entry into CenturyLink Field. A Seahawks luxury suite will include 18 tickets and 3 VIP parking passes. Up to 6 additional suite tickets can be purchased for the suite. CenturyLink Field Club suites feature premium in-suite catering options, VIP parking, HD-TVs, wet bars, upscale furnishing, and private restrooms. The Club level is considered the lowest level for suites. 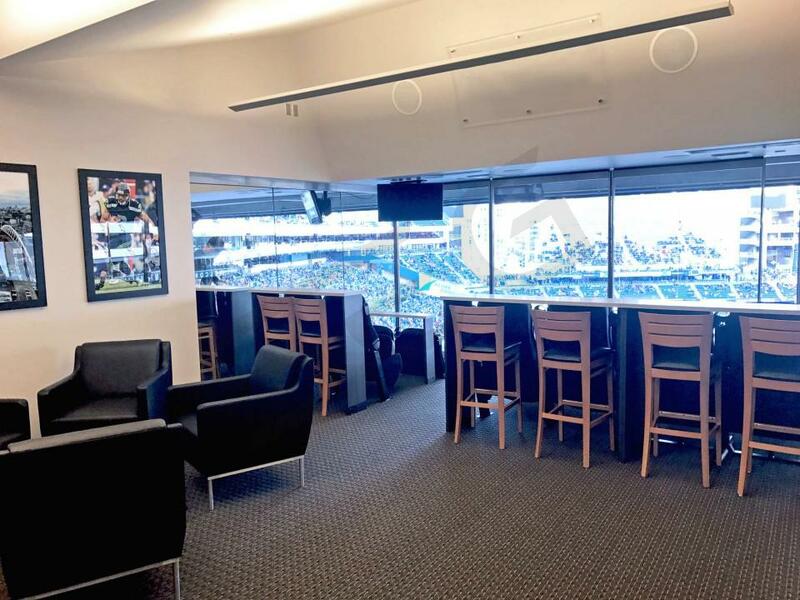 With a Seahawks suite you will receive exclusive access to VIP lounges and private entry into CenturyLink Field. A Seahawks Club suite will include 18 tickets and 3-6 VIP parking passes. Up to 6 additional suite tickets can be purchased for the suite. With multiple suite levels, most suites at CenturyLink Field can accommodate up to 24 guests. Club Level suites come standard with 18 tickets; typically, an additional 6 “standing room” tickets will be available for purchase in the Club Level at an added cost. Upper Level Luxury Suites come standard with 24 tickets. Prices for luxury suites at CenturyLink Field generally range from $18,000-$30,000. The Seahawks, who are known for their particularly loud fan base, often sell out home games. Luxury boxes at CenturyLink field are also great for the Seattle Sounders FC and concerts. Suite prices for concerts can vary widely based on the type of event. All private luxury boxes at CenturyLink Field offer wide-ranging suite catering by First & Goal Hospitality (FGH). Suite preorders are due five business days prior to the event. If the preorder deadline is missed, there is also an Event Day menu and orders can be placed upon arrival. You should allow 30-45 minutes for preparation and delivery if you order the day of the event. First & Goal Hospitality has many predetermined packages as well as a build your own menu option. FGH has an extensive 20-page menu with a wide variety of options including snacks, starters, classics, pizza, desserts, and a complete beverage menu. All Club and Suite Level tickets at CenturyLink Field will give you access to the Delta Sky360° Club Level, and the Verizon Lounge. The Verizon Lounge is an exclusive gourmet restaurant located on the Club Level. Reservations are available 3 hours before kickoff. Many Seahawks fans will be wearing their favorite player’s jersey, however many other guests in the private suite will be dressed in business casual attire. If in doubt, we recommend asking your event host what their dress-code preference is for your group in the suite. CenturyLink Field is located at 800 Occidental Ave S Seattle. There are many public transportation options for CenturyLink Field. Both Sound Transit and Metro bus services have stops within 3 blocks of the stadium. The Sound Transit Train will stop at King Street Station, just 100 yards from the doors. Additionally, the Sound Transit Light Rail has two stops near CenturyLink Field. If you plan to use a ride sharing service, we recommend Lyft as they are partners with the Seahawks. Driving is also a viable option, particularly if you have one of the VIP parking passes that typically come standard with luxury suites. Club Level suites at CenturyLink Field will come with 6 VIP parking passes compared to 3 for the Luxury Suite level. 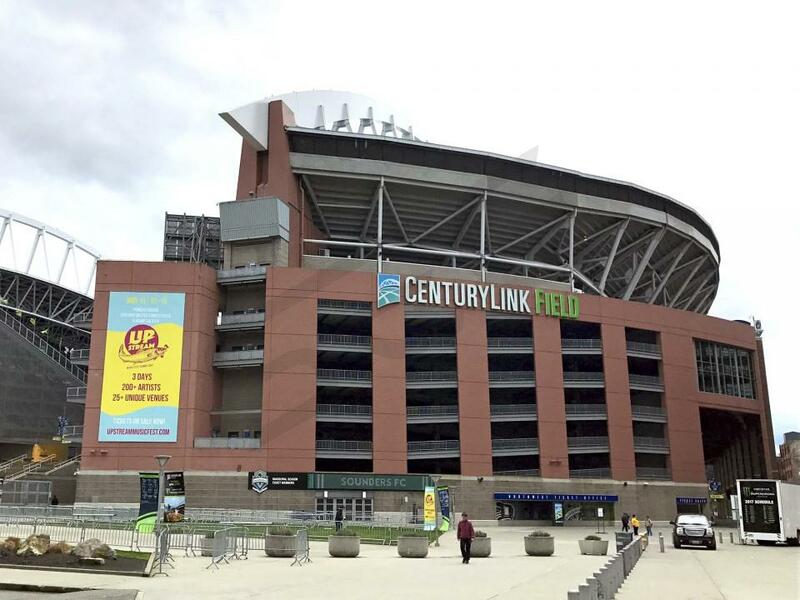 If you do not have a parking pass there are plenty of public parking options near the stadium as CenturyLink Field official parking is reserved for season ticket holders who have pre-purchased parking. Rates for the public lots will vary between $20 - $40. Additionally, there are VIP Express Line Entrances located at the NW and SW gates. Doors will open 3 hours before the game. All Suite Tickets will include entrance into the suite area for at least three hours before the game. All fans entering CenturyLink Field will go through a metal detector screening, The NFL has implemented a policy that patrons must bring all their items in bags that are clear plastic, vinyl or PVC that does not exceed 12" x 6" x 12." The revamped Seattle Seahawks enter the 2018 NFL season with a completely different look than in past years. After failing to miss the playoffs for the first time in six years, GM John Schneider decided to shake up the roster in the off-season. Household names Richard Sherman, Michael Bennett, and Jimmy Graham will all be playing elsewhere in 2018, as the Seahawks will look to go with a younger roster this season. Despite the changes, head coach Pete Carroll and Pro Bowl quarterback Russell Wilson will be back for 2018, looking to lead the Seahawks back to the postseason. The combination of Pete Carroll and Russell Wilson is a sign of continuity from the Seahawks past years of success. New additions wide receiver Jaron Brown and tight end Ed Dickson will join Doug Baldwin and Tyler Lockett as Russell Wilson’s main targets on offense. Defensive end Cliff Avril and safety Kam Chancellor will return from injury to join Earl Thomas, Bobby Wagner, and K.J. Wright on the defensive side of the football. Last year’s defense was crippled by injury, but if healthy, Pete Carroll should have an elite defense on his hands once again. With a revamped roster, the Seattle Seahawks will look to compete in a very competitive NFC West in 2018. CenturyLink Field is considered the loudest stadium in the NFL. The Seahawks’ '12th man' has twice set the Guinness World Record for the loudest crowd noise at a sporting event. Simply put, CenturyLink Field is an incredible venue to experience a football game. CenturyLink Field will see the Seattle Seahawks go to battle with the San Francisco 49ers, Los Angeles Rams, Arizona Cardinals, Green Bay Packers, Minnesota Vikings, Kansas City Chiefs, Los Angeles Chargers, and Dallas Cowboys in 2018. Experience what it’s like being part of the Seahawks’ 12th man from the setting of a private luxury suite at CenturyLink Field. CenturyLink Field luxury suites feature HDTVs, Wi-Fi, premium seating inside and outside of the suite, private restrooms, wet bars and in-suite catering options. With a Seahawks suite you will receive VIP parking passes and exclusive access to the VIP clubs inside CenturyLink Field. Seahawks suites are perfect for any occasion whether you are entertaining clients or enjoying the game with friends and family. Offense: The Seattle Seahawks have won 3 NFC West division titles in the last 4 years. In 2017, the Seattle Seahawks will once again be an elite contender in the NFC. Russell Wilson leads a talented and athletic offensive group. Tight end Jimmy Graham and wide receiver Doug Baldwin remain his favorite targets. In the offseason, the Seahawks signed former Packers running back, Eddie Lacy. Lacy fits with head coach Pete Carroll's run first approach. Lacy is a big, powerful back with similar tendencies to ex-Seahawk Marshawn Lynch. Lynch's running style led the Seahawks to some of their most successful seasons in franchise history, so fans are excited to have Lacy. Lacy will team up with Thomas Rawls in this run-oriented offense. Defense: The Seattle Seahawks are a defensive-minded football team. If the Seahawks make a deep playoff run in 2017, it will be on the laurels of their defense. The Seahawks have developed a historically dominant secondary. Aptly nicknamed the Legion of Boom, this secondary will return the 'Big three' of Kam Chancellor, Richard Sherman and Earl Thomas. If healthy, this secondary is the best in football. All-Pro defensive end Michael Bennett will return with Cliff Averil to form a solid defense line. In the middle of the field, linebackers Bobby Wagner and KJ Wright are tackling machines. All in all, if the Seahawks remain healthy, this defense will once again be elite in 2017. Schedule: CenturyLink Field is considered the loudest stadium in the NFL. The Seahawks’ '12th man' has twice set the Guinness World Record for the loudest crowd noise at a sporting event. Simply put, CenturyLink Field is an incredible venue to experience a football game. In 2017, the Seahawks will host the following home opponents: Atlanta Falcons, Arizona Cardinals, Los Angeles Rams, San Francisco 49ers, Indianapolis Colts, Houston Texans, Washington Redskins, and Philadelphia Eagles. Suites and Special Events: Experience what it’s like being part of the Seahawks’ 12th man from the setting of a private luxury suite at CenturyLink Field. CenturyLink Field luxury suites feature HDTVs, Wi-Fi, premium seating inside and outside of the suite, private restrooms, wet bars and in-suite catering options. With a Seahawks suite you will receive VIP parking passes and exclusive access to the VIP clubs inside CenturyLink Field. Suites for the Seahawks are perfect for any occasion whether you are entertaining clients or enjoying the game with friends and family. In 2017, CenturyLink Field will also host Seattle Sounders games, and Coldplay and Metallica concerts. Offense: By most standards the Seattle Seahawks had a great year in 2016, but by their standards it was a bit of a disappointment. In the Divisional Round of the playoffs the Carolina Panthers beat them 31-24 in a very competitive game but because of that the Seahawks failed to make the Super Bowl for the first time in two years. In 2016 they are hungry for another Super Bowl ring. Russell Wilson leads a talented and athletic offensive group filled with gamebreaking receivers and running backs. In the offseason the Seahawks lost Marshawn aka "Beast Mode" Lynch to retirement but incumbent Thomas Rawls will likely fill the starting tailback role effectively. Rawls started at running back for less than half the year in 2016 but he still finished the season with over 800 yards and four touchdowns, which is exceptional for a rookie back. The Seahawks star wide receiver is Stanford product Doug Baldwin who broke out in 2015 when he took over the #1 receiver role. Baldwin finished with 1069 yards and 14 touchdowns and was very close to being named to the Pro Bowl. The other major weapon in the passing game is tight end Jimmy Graham. The former Saint had a down year with the Hawks last season but the team is hoping that another year of learning the offense and developing chemistry with quarterback Russell Wilson will lead to a huge season for the massive tight end. In the end how this offense performs really comes down to All-Pro Quarterback Russell Wilson. Wilson is one of the most dangerous quarterbacks in the league because of both his passing ability and his legs. The former Wisconsin star was the only quarterback in the NFL to finish with at least 4,000 passing yards, 500 rushing yards and 35 total touchdowns so fans should expect big things from him this year. Head Coach Pete Carroll is looking forward to a great year and he has made it clear that he expects this team to compete for the title. Defense: The Seahawk's secondary has been aptly nicknamed the Legion of Boom and features All-Pros Kam Chancellor, Richard Sherman and Earl Thomas. Kam Chancellor is a linebacker playing the safety spot who specializes in big-time tackles and demolishing any offensive players in his immediate vicinity. Earl Thomas plays free safety and centerfield, he patrols the wide open spaces of CenturyLink Field making things as hard as possible on opposing quarterbacks. He led the team with five interceptions last season. Richard Sherman focuses on shutting down the opposing teams best receiver and is considered one of the best if not the best cornerbacks in the league. In the offseason, the Seahawks lost talented outside linebacker Bruce Irvin to the Oakland Raiders but the team feels that former Jaguar Chris Clemons will do a great job filling that role. All-Pro defensive end Michael Bennett is a monster in between the tackles and is a nightmare for opponents to block. Bennet led the team with 10 sacks last season. The last All-Pro on this star studded defense is middle linebacker Bobby Wagner. Wagner is one of the best middle linebackers from sideline to sideline and is incredible chasing down running backs who think they have some space to get away. In short, this Seahawks defense is going to make CenturyLink field hell for opposing offenses. Schedule: CenturyLink Field is considered one of the loudest stadiums in the NFL. The Seahawks’ 12th man has twice set the Guinness World Record for the loudest crowd noise at a sporting event. In 2015, the Seahawks will host the Arizona Cardinals, Los Angeles Rams, San Francisco 49ers, Minnesota Vikings, Dallas Cowoys, Miami Dolphins, Atlanta Falcons, Buffalo Bills, Philadelphia Eagles and Carolina Panthers. Suites and Special Events: Experience what it’s like being part of the Seahawks’ 12th man from a private luxury suite at CenturyLink Field. 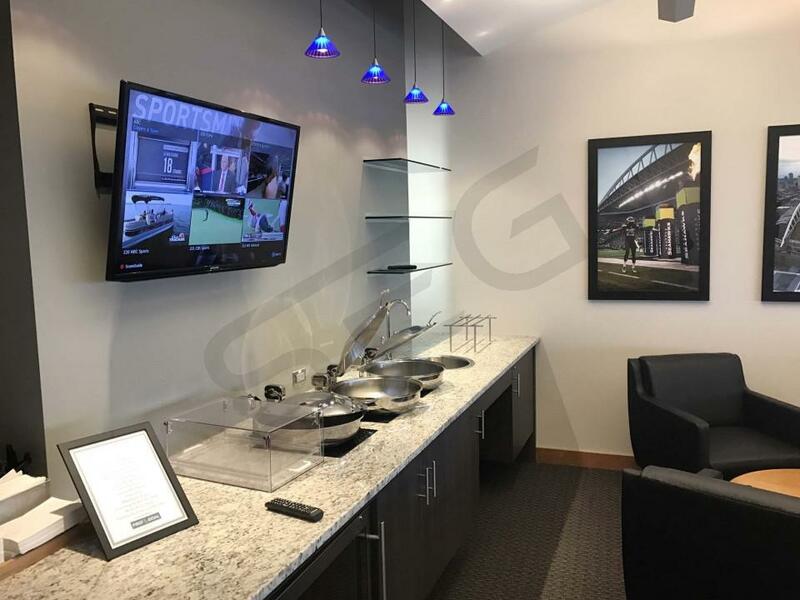 A Seahawks luxury box features HDTVs, Wi-Fi, premium seating inside and outside of the suite, private restrooms, wet bars and premium in-suite catering options. With a Seahawks suite you will receive VIP parking passes and exclusive access to the VIP clubs inside CenturyLink Field. Suites for the Seahawks are perfect for any occasion whether you are entertaining clients or enjoying the game with friends and family. In 2016 CenturyLink Field will host Seattle Sounders games, Kenny Chesney and Miranda Lambert, and Guns N Roses. The 2013 Super Bowl Champions are ready to defend their title in 2014. The Seattle Seahawks will remain as one of the NFL’s top teams behind their stars Russell Wilson, Marshawn Lynch and Richard Sherman. Head coach Pete Carroll and the Seahawks will have one of the toughest home schedules. Coming to CenturyLink Field this year are the Green Bay Packers, Denver Broncos, Dallas Cowboys, New York Giants, Arizona Cardinals, San Francisco 49ers and the St. Louis Rams. The Atmosphere at CenturyLink Field tops the league and you will get all that same excitement and more from inside one of the Seahawks’ private luxury suites. Luxury boxes at CenturyLink Field include first class amenities such as premium in-suite catering options, VIP parking, HD-TVs, wet bars, upscale furnishing, and private restrooms. You will get private entry into the stadium and exclusive access to CenturyLink Field clubs and lounges. Suites for the Seahawks are perfect for any occasion whether you are entertaining clients or enjoying the game with friends and family. Thank you for signing up for specials at CenturyLink Field. Enter your email address below to stay in touch. We'll sign you up for our newsletter, which will inform you of the latest inventory and events at CenturyLink Field. We promise we will never sell or distribute your information. 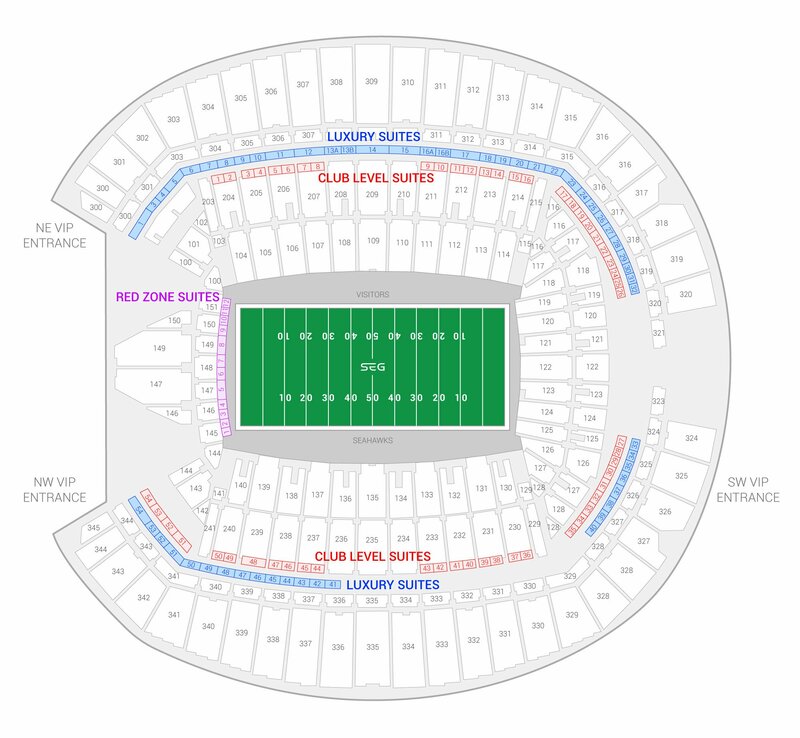 The seating chart below shows where the Seattle Seahawks suites at CenturyLink Field are located.